As I write this Dunedin has turned sunny finally and although obviously I'm not out in it right now, I will be later today. Currently I'm sat in Emma's flat, abusing her internet, lsitening to her Dire Strait's LPs (Comminique at the moment) and not really worrying about much. Having gotten all packed up and ready to go the night before my flight to Nelson I then couldn't really sleep. I had taken my bedding to Katy's (my amazing Sister) and with the sleeping bag packed at the bottom of my bag, I curled up on my bed in my hoodie. Thankfully Wellington had a warm night, but I still didn't sleep well, over excitement waking me an hour before I needed to be. The flight went smoothly enough, and on getting to Nelson I grabbed my bike box and started unpacking in the middle of the airport carpark, much to the amusement of some of the other passengers. Bike all ready to go, and tyres pumped up I set off towards town with the promise of coffee, a bike shop to dump my bag at and fast, dry trails awaiting me. Owen had put me in touch with one of his friends Vaughan Watson, whose father owns 'Stewarts Avanti Plus' in Nelson (well worth a visit even just for the good guys that work there) and who has been working there himself over Summer (Vaughan would also be joining us for some of the trip, and would abuse his hospitality some more in St. Arnaud). Vaughan stashed my bag and bike for me whilst I went for a mooch round town, found a coffee then directed me to the trails. From there it was a matter of riding laps and getting a little lost. 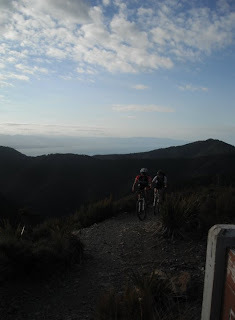 The trails were seriously good fun, my personal favourite being the gully track. I felt like I was pinning this track, especially a certain left hander with a hidden (but large) rock in the middle of the corner. Braking for this the first few times was done late as usual having come in good and hot, however a hole had started to develop on my line meaning that my front wheel was locking just before the corner and I was skiing through the turn; not a bad way to do it, but not something i wanted to be risking doing come race day. If only I could have raced that day instead of 3 days later. I was going to be staying with Owen's family in Hira, about 20km outside Nelson, so having put in 5 laps and a bit more riding (also having done repair 1 for the trip; trailside rebuild of an xtr rear mech, which I have now realised was the cause of my crash in Napier; so much play in it that it does not hit shifts under power well) I started to roll over there and on my way realised that my bag was far too big! Time to ditch some stuff with my unsuspecting sister (did I say before how amazing she is?). 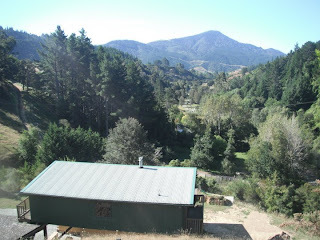 The house was pretty sweet, with a really nice view. Owen and Andy arrived later that afternoon, pretty tuckered out having ridden from Picton over the Mongutapu saddle (I say ridden, I'm still not sure how much was walked, but fair enough, I'm glad I didn't do that, although it did sound amazing). So pretty soon we all crashed out and started to plan the next day. 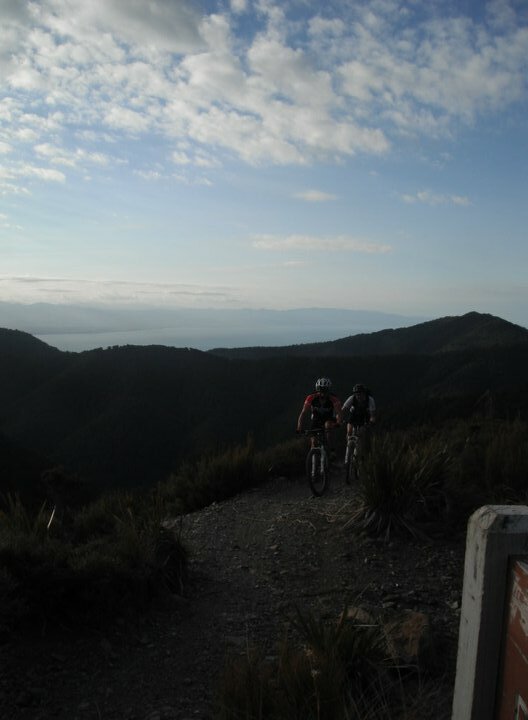 The following morning we rode into Nelson off road via Teal Valley before tapping out a gentle lap of the track proceeded by another coffee. The majority of the rest of the day was spent lazing around, doing a bit of organising and a lot of eating whilst waiting for Vaughan to get off work so that we could go and ride Coppermines. Coppermines was a bit of a slog of a climb up, but well worth it, not only for the descent, but also the amazing views from the top. The descent consisted of some fairly large rocks and deep drainage bars which required a fair amount of arm power to blast/manual through. I definitely wouldn't have minded a fully for this ride. However when the hard earned descent eventually ended I still wanted more. Going back up the hill to home it transpired that my body really wasn't up for more though, bonking half way up left me in my usual quiet, reserved and shaky state. The day before the race dawned and once again we were off into Nelson to go and watch the downhill. I met up with Katy (who had flown in to support her little brother, did I say amazing?) and we made the walk out to the XC course, managing to blag a lift from the DH uplift guys from there to the DH finish. We then strolled up the gnarly course in jandals, carrying beer and food. Turns out that Jandals were a little ambitious for the dusty, steep nature of fringed hill, and although Katy is amazing (she's going to think I want something now, maybe overdone the amazing a little bit), even she struggled a little getting up the course. We met the guys on a big corner with a drop on the inside line with the landing/berm massively blown out. 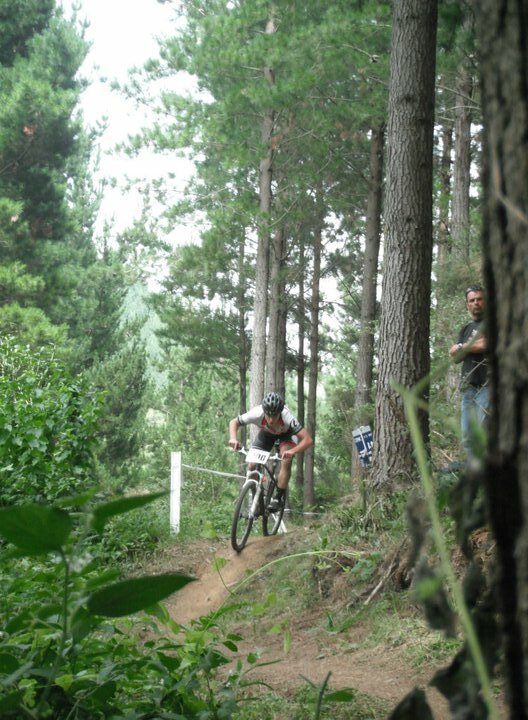 I honestly don't think I could have ridden the Nelson course, which is the way a DH should be! The boys had managed to secure an old Turner swing-arm and handle bar and were making the most noise in the hill. Perfect. 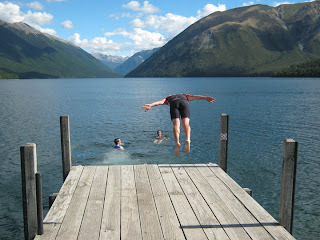 I will do a quick VFTP (View From The Pack) for my race then I will stop this blog and go and enjoy the sun for a bit. Part 2 will have to be the road trip proper and probably slightly more condensed!! I knew my legs were in a bad way, I don't think I had ever felt this fatigued coming into a race. The plan was to take is steady from the start, enjoy the descents and just keep on ticking over, hoping not to get pulled. The race went to plan in all ways except for the fact that I did, unfortunately get pulled. With one lap to go. I was pretty devastated by that having kept my head and ridden evenly (albeit slowly). From the start I was on row 3, but went straight to the back off the line, which I was fine with. 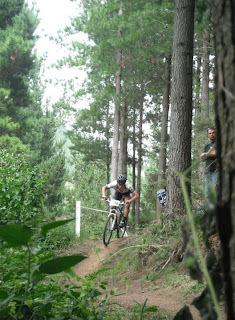 I put in a small effort near the top of the start straight (a long 4WD climb) to move up a couple of wheels before the Gully singletrack descent. From here on in I just set a steady pace, occasionally overtaking people, but mostly just relaxing. Every lap I looked forward to the last descent and one corner in particular. A gang of noisy downhillers (I think) had collected here to shout and abuse, perfect motivation. So every lap I would ride that corner pretty hot, drift out, carry speed then moto-whip over a little roller after the exit. I loved the cheers every time. So even if the race as a race wasn't that good, I enjoyed showing off a little. Always good to have a loud crowd! I will leave with a photo that epitomises freedom for me. Also as a bit of a teaser for the next blog.